The camper was designed for a valued customer who is a keen 4WDer but is also mobility-challenged. "He required a camper easily set up from seated in his wheelchair and the ability to get in and out of bed independently," Pioneer's Mark Hawkins said. "We jumped at the chance to assist." Pioneer wored with the client to incorporate all the features he needed including automated opening and closing, swing-away spare wheel, and a mounting positions for a winch-operated quad bike rack which the customer is designing himself. 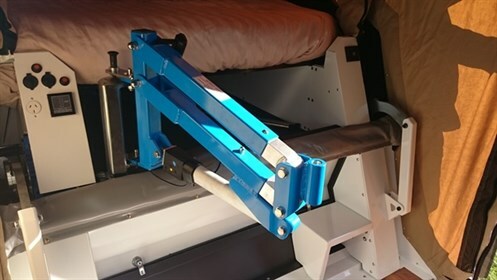 A remote operated hoist has been designed to assist movement from the wheelchair to the bed in one simple motion, and the step has been modified to allow the hoist to remain in position when the camper is closed. "Pioneer is eager to make sure offroad camping in a Pioneer camper is available to all 4WDing driving punters out there," Hawkins said. Pioneer was a 2016 finalist in Camper Trailer Australia's Camper Trailer of the Year competition with the Pioneer Onyx hardfloor camper.